I read recently that the words “bucket list” are going out of style, as trendy words sometimes do after overuse during a period of time. Personally, since doctors gave my mom the terminal cancer diagnosis, I have not been too concerned about the trendiness or overuse of the word. It is much more important to me that she is living her bucket list. The pictures in this post are of my mom. 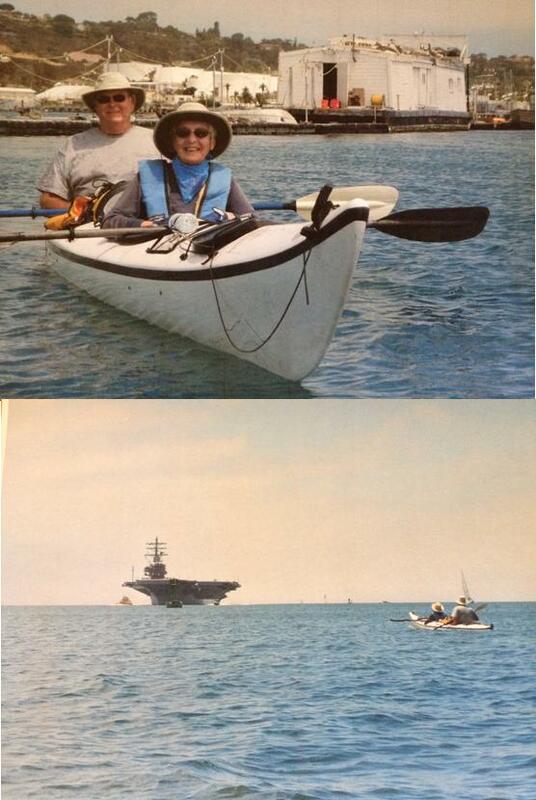 In a kayak. Out in the ocean. Way out. With seals and (big!) boats and waves. Remember, my mom is almost 80 years old and fighting cancer with bi-weekly chemo treatments. She is fragile and weak. She hates to fly and has to smoke… BUT she traveled to San Diego to spend time at the ocean she loves with a friend who loves her… AND she took a seven hour adventure in a kayak… and she loved it! Too often I let fear or inconvenience or what-others-will-think get in my way of trying something new or pursuing a dream or taking on a challenge. I can settle for comfortable instead of fulfilling, good enough instead of invigorating, status quo instead of satisfying. But I want a life that is more than just adequate. I believe God created me for an abundant life. I want to live all-out and full-force with less hesitation and more heart, fewer petty concerns and more passion, less worry and more freedom. Tim McGraw sings a country song that says, “I hope someday you have the chance to live like you were dying”. My mom is helping me learn to live that way. How about you? Do you have a bucket list? What holds you back from living life to the fullest today? This entry was posted in family, life and tagged abundant life, adventure, bucket list, cancer, freedom, kayak, live like you were dying, Tim McGraw by terry morgan. Bookmark the permalink. Living like we’re dying really does sum it up. Why do we wait till the time’s running out to pursue that which brings life to our hearts? I’m so thrilled for your mom–even more thrilled for you to see her push through and pursue. Thanks for the sweet reminder to live well now. It was so exciting for me to see her step up to this adventure, I couldn’t not write about it! It was thrilling to see the sparkle in her eye as she told the story full of details! Yes, let’s live each day well! I think that many, not all, but many people going through times like that, where you are practically saying good bye to a loved one, get the chance to learn how to appreciate life, “we” (including myself) had other new opportunity to see the life that we are living from a different perspective, and I think it is good, good to learn form the courage and determination of those who we love, and what it is even better, it is the fact that we will have more time to enjoy life. So true! “…Good to learn from the courage and determination of those who we love” and apply it to each day we are blessed to live! Thanks for your continual encouragement!